The year is 2011 and Intego has two antivirus solutions available in the Mac App Store; VirusBarrier Express and VirusBarrier Plus. These were my go-to recommendations for anyone that wanted or needed an antivirus product. In 2014 the apps were pulled from the App Store as the limitations the App Store placed on apps were hindering the functionality of the products. I could have kept on recommending Intego but people were much more willing to grab an app from the App Store than downloading a full installer from the Intego website and running a trial of their antivirus suite. With no other App Store options available worth mentioning, my recommendation shifted to Thomas Reed’s Adware Medic script. And this simple and effective scanner (which later turned into an app and then turned into Malwarebytes for Mac) has been my recommendation for three years. Until today! Don’t get me wrong, Malwarebytes for Mac is still a solid little scanner. It has a list of malware signatures and the locations that malware typically hides in and goes after it. A scan typically takes a minute or less and is a good indication to see if a full system scan from an actual antivirus product is warranted. My recommendation is typically “Malwarebytes for a quick scan and if it finds anything or you want to be sure your system is clean, go Intego.” and this has worked out well for a lot of people. Some stuck with Malwarebytes, some shifted to Intego. 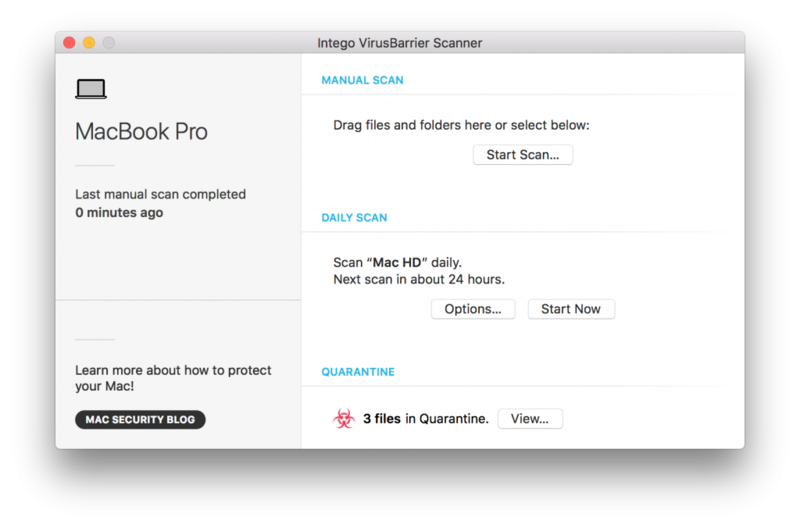 Today Intego launched VirusBarrier Scanner, available in the App Store and compatible with any Mac running OS X 10.10 or later. And with that, my recommendation has immediately shifted back! I have been testing VirusBarrier scanner for a few weeks now and found it a solid little app. It’s powerful, capable, backed by the full catalog of virus definitions that their VirusBarrier X9 product uses and most importantly; finds and eradicates all kinds of malware. There are still users out there that run the old VirusBarrier Express (which has continued to function and receive virus definition updates). If you are one of those users, I still recommend downloading the new VirusBarrier Scanner, I’ll explain why. Very fast. In my testing it used whatever processor power it could get it’s hands on. More available processor cores means more juice for VirusBarrier Scanner to get the job done faster. Even on a 12-core Mac Pro all cores and virtual cores were used. Meanwhile the memory impact was negligible at just 400 MB. In comparison, VirusBarrier Express only uses 50-70% of a single core by default and there is no way to change that. Unpacking archives (.zip for example) takes processing power. And because it has access to a lot more of it, unpacking is much faster. You can enable an option called “low priority scan”. With this on, processor use is cut in half. If you have an older Mac or need other tasks to not take a performance hit, this is the option for you. And it scales. The more you have going on that requires processing power, the less VirusBarrier Scanner will use. If a malicious file is found, it is quarantined. From there you decide if you want to delete or repair & restore the file. In comparison, VirusBarrier Express gives you an “Ignore” or “Repair” option and the decision must be made on the spot. VirusBarrier Scanner is still an on-demand scanner. This means it will only run when you tell it to or schedule a daily scan. There is no real-time scanning, for that you will need VirusBarrier X9. Scheduling a daily scan to start at 2am for example, or while you’re out to lunch is easy and won’t affect your workflow as you’re not around anyway. This is done by enabling the daily scan at the time you want it to happen going forward. Enable it at midnight and VirusBarrier Scanner will run the daily scan at midnight from then on. These daily scans can be configured in a few ways; Essential Protection or Maximum Protection. Essential Protection focuses on locations where malware is commonly found. This gives the scanner a high probability of finding malware while keeping the scan duration relatively short. Maximum Protection, as the name implies, focuses on finding malware wherever it may be hiding on your system in the form of a full drive scan. Slick, fast and effective. Everything you want in a free malware scanner. I suggest you go grab it right now!